Inventcom’s patent pending solution CNCnetPDM enables to acquire, monitor, track and document quality related machine data and process parameters from highly diverse manufacturing devices. Unfortunately it’s not important how many good parts were delivered - only the bad ones count. The pressures on subcontractors and manufacturers are greater today than they have been any time in the past. Part tolerances continue to tighten unabated because of the relentless miniaturization of technologies. At the same time the market is demanding shorter lead-times and shipments with zero defects. It has become commonplace to include penalty clauses in contracts if these stringent demands are not met. CNCnetPDM for process monitoring enables to identify the reasons for poor quality production parts, eliminating scrap and the need for costly 100-percent inspections post production. It can also protect machine and tools from excessive damage, thereby reducing operating costs and increasing machine uptime. And because the machine is protected, it can run untended, increasing effective manufacturing capacity and staff efficiency. 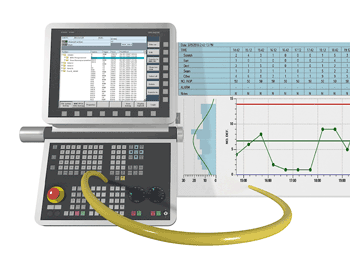 CNCnetPDM for process monitoring measures the machining process in real-time by acquisition of all process parameters that may impact quality directly from the production machine. The actual data can continuously be compared against target values which represent a good production cycle. Deviations from standards that exceeds the pre-set tolerance limit are documented and can be tracked. Charting tool related data of the machine from cycle to cycle reveals the tool wear over time. This wear can also be enveloped, allowing the user to maximize each tool’s life, reducing unnecessary costs from inspections or premature tool replacements. CNCnetPDM for process monitoring extracts data via the built in standard communication interface of the machine. The ‘software-only’ solution requires no additional hardware at the machine or modifications of the machine’s programming. 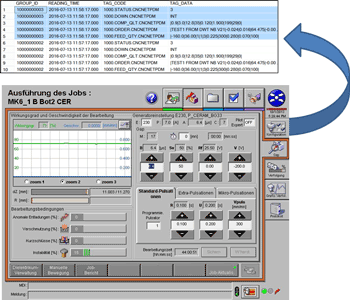 Due to its revolutionary technique CNCnetPDM for process monitoring can be implemented on almost any production machine. Although collectable process data depends on the capabilities of the device most modern machines rather deliver too much than too little data. In this case the challenge is more to identify the relevant parameters which then can be set into relationship and synchronized with each other - for example job related parameters with generator and coolant output. Critical to understand is which type of data provided by the machine to use to monitor the process. This has to be accessed on a machine-to-machine basis and is, to a degree, dependent on the type of machining, parts machined and tools used. Preference is given to monitoring process data and parameters that directly influence the quality of parts produced such as workpiece offset (1), tool data (2), coolant temperature, warnings and errors output by the machine (3) or data from attached sensors or feeder devices. CNCnetPDM for process monitoring has a very good return on investment. Most users of the solution fall into one of two categories: producers who have to document their manufacturing process due to regulatory, indemnification or warranty related requirements; and producers of high value items, which tend to use expensive tooling and materials. User feedback shows that for the right applications the typical payback period for the solution is usually between 6 and 12 months. Prove produced quality: There are various reasons and potential sources for issues of products reported by a customer. Discussions about warranty or indemnification claims can be avoided as all data of the production process is available and quality can be ascertained. Regulatory compliance reporting can be optimized by providing real-time, automated identification and tracking of production. Shorten development time: Data recorded during development of a product or improvement of a process can be used to compare output quality with set up parameters of the machine. This enables to quickly find out optimal parameters for the desired result. Eliminate faulty production: Due to constant monitoring and recording of quality related process parameters and machine data the reason for faulty production can be detected and eliminated. Personnel can be deployed more effectively preparing the next job, rather than manually documenting the process parameters of ongoing production. Reduce tooling costs: Process deviations caused by tool breaks are detected instantly, triggering an alarm with notification of the operator. Tooling costs are also reduced because of extended tool life, less unnecessary replacements, checks and or tool maintenance with the help of trend analysis. 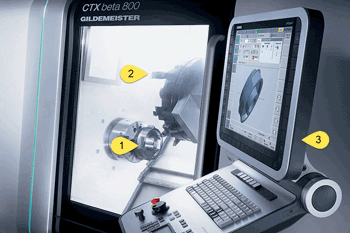 In-process quality control: Data from sensors that measure critical dimensions of the part during the machining process and sort those parts that are found to be outside a preset tolerance limit can also be captured by CNCnetPDM. Combination of sensor output with other machine data enables to detect and eliminate the underlying cause for faulty parts. Increase capacity or enable unmanned production: Production tends to get interrupted during breaks and shift changes. With CNCnetPDM, production can continue uninterrupted during these times, effectively boosting production capacity without having to invest in costly production machines. Spindle monitoring/crash protection: Others use CNCnetPDM to enable unmanned night shift production without the worry of something potentially going wrong. Machine repairs not only cost valuable production capacity, but the repairs themselves often cost a lot of money. A tool breaking can cause substantial collateral damages to the machine as will faulty programming or accidental spindle overloading.